In our last post, our stylist Chantelle Znideric reminded us of the importance of personal style in developing a strong personal brand. Of course, that’s only one dimension of outer branding. As Vocal and Communications Coach Susan Heaton Wright also showed us in recent posts, voice and presentation are also critical components of our brand. When it comes to making an impact, your body language speaks volumes about your self-confidence, approachability, and general attitude. I recently came across this picture showing Steve Jobs from 1998 through 2010. Wow. Talk about a consistent signature style! But the picture also shows us what helped to make his presentations so powerful…his body language. Presenting as confident and approachable were essential parts of his personal brand. To carry on with our recent theme of public speaking, let’s take a look at the influence of visual presence on the way you are perceived during a presentation. According to Public Speaking International (PSI), body language is vital for influencing listeners and getting your message across. Given that audiences make decisions about your credibility, believability, and likability within the first 30-60 seconds of your speech, your visual presence can make an impact the minute you hit the stage! In fact, visual communication is so essential that PSI make working with the body a key element of their public speaking coaching and training (I highly suggest checking out their blog – it’s loaded with valuable public speaking resources – and in particular, downloading their free learning guide “How to Use Body Language and Gestures as a Speaker“). the importance of appearance and voice in making an impact. 1. Move just before your next key point, and stay there while you discuss it. If you have three key points, for instance, take up three positions in your performance space. The size of your stage will determine how far you should (or can) move. Your audience will find it easier to retain each of your talking points if you help them visually this way. 2. If you’re discussing a chronology, move from their left to their right. Let’s say you’re discussing the history of the company. During “The Early Years” you’re positioned to your audience’s left. “The Middle Years” finds you center stage; and on “The 21st Century” you’ve moved to the right. People in the West read left to right, and so they can easily follow your time line if you move that way. 3. Stand with your feet at shoulder width, and gesture but don’t walk or wander. Standing steadfast means you appear steadfast. You and whatever you represent can be counted on, because you’re rock solid. Speakers who wander have all the definition of an amoeba, and they’re just as difficult to stay focused on. 4. Approach the screen or questioners. If you need an excuse to move (and you do), here are a couple of good ones. Going up to a screen is more dynamic than using a laser pointer. And anything that brings you closer to the people you’re trying to influence is a good idea. 5. Pro and con. Here’s another way to move that’s naturally tied to your content. If you’re discussing both sides of a question (“Should we go ahead with the acquisition?”), stand on one side of the stage while you discuss the “Pro.” Then move to the other side while you’re talking about the “Con.” If your conclusion lies on the Con side, stay where you are to finish up; if you’re Pro, go back to where you gave that argument to deliver your conclusion. 6. Breathe. Yes: it’s movement. Specifically, it’s purposeful movement when you breathe diaphragmatically. Belly breathing gives you a fuller, more resonant sound, and allows you to project to the back of the room. Boa constrictors take away the ability of their victims to breathe. It’s an effective way to take the life out of a speaker. 7. Create visual variety. Audiences naturally have a hard time paying attention. They have to remain passive. Speeches are monologues rather than dialogues. And too much information is delivered verbally rather than visually. In addition to your slides, your flip charts, and the marching band you parade down the aisle (surprise!) you yourself must create visual variety through your body language. Make it real and as subtle as it needs to be. But think about it, and do it. 8. Smile. Smiling, in addition to being a pleasant element of a speech or presentation, serves a serious purpose. It fosters audience engagement. Whoever you are or whatever type of speaking you do, chances are you don’t smile enough. Speaking in public can be nerve-wracking. Just don’t let your audience see that it is. 11. Build in interaction in your attendees. This suggestion is slightly different from those above, because it concerns your audience rather than yourself. 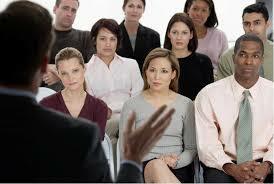 Have them incorporate body language into your presentation. If they have to stand, turn to the person on their left, form a circle, etc., their own presence and engagement in your presentation will improve. 12. Gesture sparingly and in ways that amplify your message. Start with your hands in the neutral position, i.e., at your sides. Bring those hands up when you absolutely have to gesture as you say this thing (or that thing). Then let them go back to “neutral.” The gestures you make will be strong and focused, and will give “oomph” to whatever you were saying at that moment. Starting out with one’s hands at one’s sides takes some getting used to, but it’s worth it. 13. Give your audience the whole you. You are more than just your message and the words you are using to convey it. You are a physical presence; and your voice is capable of subtleties few of your other communication tools can equal. When you get your body into the act, the fullness of who you are and what you represent is on full display. So let ‘er rip! 14. Boost your own self-confidence. Stand up right now. Imagine you’re in front of an audience of stakeholders. Say something out loud that commands their attention and faith in you, but say it in a soft voice and without a whisper of movement of any kind. That shook them up, didn’t it? Now try it all again with a strong gesture and some purposeful movement. Which you was more confident, Speaker A or Speaker B? 16. Facial expressions give clues to your trustworthiness. Animal depend upon their sense of smell to recognize others, but we use facial features. We also judge a person’s honesty and their intentions by the subtle changes of expression they display. Audiences even find it hard to be persuaded by a speaker who doesn’t use good eye contact. Be aware that your countenance should gel with what you’re saying. Practice with a mirror. And if you lack facial expressiveness, try to get something going, at least with your eyes. 17. Watch your audience. Too many speakers wear blinders when they speak, trying above all to just get through their presentation. Anxiety produces that response, but public speaking doesn’t really work unless the speaker notices whether he or she is getting through to the audience. This is one instance where their body language can influence your own. 18. Stay open. Avoid the fig leaf position, “washing the hands,” the church-steeple effect, or anything else that has you crossing or clasping your hands in a way that closes you off from your listeners. You need them to stay open to your influence, and you have to model such openness for them first. When you and I speak, we’re exposed: there’s no way around it. From that exposure and vulnerability arises true influence. 19. Eye contact. You knew this one would be here somewhere, didn’t you? Some people fear that making eye contact with audience members will throw them off track. But people are the reason you’re speaking, after all, and connecting with them should help not hurt your concentration. Use solid eye contact throughout your presentation, but especially in your greeting and opening remarks. That’s when the rapport with your listeners needs to take flight. 20. Show your enjoyment. Generally speaking, audiences respond in kind to whatever you do or show them. Be the picture of grim determination when you speak, and your audience will find a way to hurry off to that root canal they’ve been putting off. Look like you’re having a blast, and chances are they will too.